Flexsteel Helm Chairs take you to the seas with comfort, support and durability. The Flexsteel 431 PBSR, A482, 439 and 430 Low Back are 4 of the industry's best Helm Chair seating values. 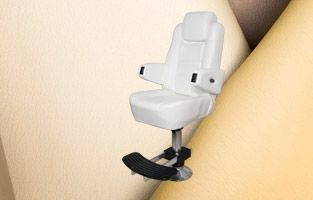 The 431 is the best all-around Helm Chair value in today's seating market, and The 431 is our BEST SELLING HELM CHAIR. These above & below deck Flexsteel Helm Chairs are designed for your active marine lifestyle. They feature heavy gauge anti-corrosive tubular frames and sinuous spring suspension for both strength and a cushioned ride. Their comfort is enhanced by high resiliency, marine furniture grade sculpted foam and are tailored in glove soft Ultraleather, Sunbrella or marine grade vinyl. We also offer a variety of pedestals and above deck covers for your Flexsteel Helm Chairs.